We offer a patented gutter protection system that fits any residential gutter system. Not only does our gutter protection system save you the time and expense of cleaning gutters, it also prevents clogged gutters that can be home to many insects. Our low profile components make this system virtually invisible from ground level. Eliminates the need to climb a dangerous ladder and clean your gutters! 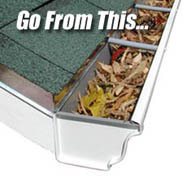 Leafproof ® installs onto your existing gutters. Keeps leaves and debris out, eliminating clogged, over-flowing gutters! 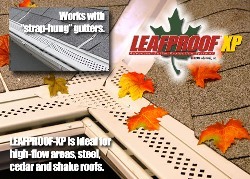 Leafproof ® doesn’t cause roof leaks by needing screws or nails to install! Leafproof ® also helps protect your roof from ice dams. Guaranteed for life! Prevents leaf buildups in gutters that make a home for insects! Prevents animals and birds from nesting in gutters! Except in areas where the roof line has concentrated water flow (such as an inside valley), water flowing off the roof does not shoot to the front of the gutter. 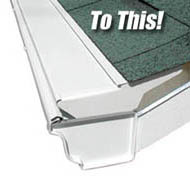 It simply follows the roof line on to the drip edge which is under the shingles, and moves down the back of the gutter. The reason that the water does not shoot to the front lip is that water clings to the surface it is flowing over, with the aid of a process known as surface tension. LeafProof® makes surface tension work for you. The “S” bend causes the water flow to reverse and churn, which slows the momentum of the water as it comes off the roof. As a result, when the rainwater flow reaches Leafproof’s® water channel, the water flow once again reverses and drains into the gutter. It’s simply brilliant! There are other gutter covers on the market that work in a similar manner. However, these gutter covers do not have Leafproof’s® patented “S” bend, and typically lack the extra Leafproof features that block wildlife like rats or squirrels. Furthermore, many other systems must be nailed or anchored into the roof creating the potential for costly roof damage and water leaks. Leafproof installs easily, stays in place, and provides years of fantastic service that makes your life easier. Call today for a free estimate!